Historically, Red deer were considered a ‘beast of chase’ by the Norman kings who set aside large areas of their kingdoms so they could hunt stags. Deer and other hunt-worthy animals were protected by stringent “forest laws” and poaching of the king’s deer was met with often brutal punishment. I’m planning a separate article looking at deer management in Britain, so don’t plan to go into any detail here. Instead, that which follows summarises the information specific to Red deer because this species represents an important part of the tourism industry as well as having significant potential to impact cereal crops and plantations. The available fossil data suggest that Red deer were probably the earliest deer associated with British woodlands, having appeared during Europe’s mid-Pleistocene Cromerian Interglacial period, about 400,000 years ago. It appears that Red deer disappeared from most of Europe during the Younger Dryas cold spell, returning and extending their range to Great Britain during the early Postglacial period. For a comprehensive and enlightening account of Red deer history in Britain, the reader is directed to Derek Yalden’s seminal 2002 book, The History of British Mammals. In summary, though, we have a good record of Red deer in Britain dating back to the end of the Anglian Glaciation, some 300,000 years ago, in remains from Hoxne in Suffolk. Remains dating back to the Wolstonian Glaciation of Jersey suggest that human hunters were taking Red deer as prey around 150,000 years ago. Indeed, there is even some evidence to suggest that early man farmed deer for their antlers, which were carved into tools and jewellery. The influence of Red deer on early settlers can be seen in the research of Sarah Beswick; her investigation, recounted by Yalden, has turned up at least 185 place names referring to Red deer, including Hartwell in both Aylesbury and Northamptonshire, and Hindhead in Surrey. Interestingly, archaeological evidence suggests that the Red deer present around the time of the Devesian Glaciation (which ended about 12,000 years ago) were considerably larger than modern day animals, rivalling the Canadian wapiti at about 400 kg (880 lbs. or 63 stone) and with basal antler circumferences of almost 30 cm (12 in. ), compared to the 120 kg (265 lbs. or 19 st.) and 20 cm (8 in.) of today’s Scottish hillside stags. We also have remains from Somerset that date to between 12,800 and 11,900 years ago, putting Red deer among the late glacial mammals of Britain and hence giving them their native status. In Ireland, Yalden notes that carbon 14 (radioactive) dating of remains found at County Waterford, part of the province of Munster in the south of the country, suggests that Red deer were present around 26,000 years ago and possibly as long ago as 39,000 years ago (mid-Devensian Glaciation). Red deer seem to have survived well following the retreat of the ice at the end of the last (Devensian) Glaciation, when Britain was a largely tree-covered island. Growing pressures for land led to clearing of woodland for farming and settlement intensified with the arrival of the Romans and it is likely Red deer populations suffered in the face of this habitat loss. At the same time, deer were considered “beasts of chase” and widely pursued by both communities and royalty. The Saxon kings introduced a series of Forest Laws to secure their quarry - these laws dictated, among other things, who could kill game, who could live in the forests and how high fencing could be. Several “Royal Forests” were established in England, with Epping Forest in Essex's Ongar Great Park thought to be the first, established by King Canute. Up until the Norman Conquest, kings were free to hunt their own lands in England, but the arrival of William the Conqueror saw the practice of deer hunting as a pastime of royalty and artistocracy firmly established, along with several other Royal Forests and deer parks to provide sport and venison for the royal tables. One of the best-known Norman forest designations occurred in 1079, when William declared an area of Hampshire a royal hunting preserve in which only he was permitted to hunt – today we know this as the New Forest. The Forest Laws remained until Henry II took the crown and King John replaced some of the harsher Norman penalties in his Forest Charter. The charter remained in force until the 15th century and any kind of Forest Law had virtually disappeared by the end of the 16th century. During the 1500s, deer became more of a fashion accessory to the aristocracy and no grand estate was complete without deer roaming the grounds, particularly herds containing unusually coloured animals, but at the same time interest in wild game began to wane. As the Crown began to lose interest in deer, the forests were progressively felled and sold off to private owners or divided up by Enclosure Acts. Queen Elizabeth I revived some interest in the forests as a source of deer, which saw number rise again by 1586, and some of the Stuart monarchy maintained an interest in hunting. Interest was, nonetheless, patchy. Come the reign of Charles I, the Civil War saw poaching increase significantly and many deer parks broken open, allowing their captives to escape into the English countryside. Further north, by the end of the 18th Century, few forest stands remained in the Scottish mountains. The breakdown of the Scottish clan system led to the immensely unpopular Highland Clearances of the late 1700s and early 1800s, during which landlords evicted people from their homes in the glens and imported considerable numbers of blackface sheep, which added to the grazing pressure already applied by the deer. Eventually, the sheep and their shepherds were translocated to New Zealand and there was a substantial decline in Scottish hill sheep farming and deer numbers increased. Traditional stag hunts (i.e. those carried out on horseback with a pack of hounds) never really regained the same popularity in Britain, although there were still a few mounted stag hunts operating up until the late 1990s. In 1997, University of Cambridge physiologist Professor Patrick Bateson presented a controversial report to the British government suggesting that deer suffer unnecessarily from being hunted with hounds. Despite opposition from pro-hunting groups, including the Countryside Alliance who published their own report suggesting almost the exact opposite of Bateson’s conclusion in 1999, the result was the passing of the Hunting Act 2004. This Act made it illegal to hunt several of Britain’s mammals, including deer and foxes, with packs of dogs. Interestingly, if you read the reports you find that the data are actually very similar, but the authors draw opposing conclusions from it. The situation is far from clear, but anyone wishing to find out more is directed to Richard North’s overview, The Hunt at Bay: A Paper on Stag-Hunting. Managing deer at a countrywide scale is an immense challenge; one that’s all the more difficult because there is no UK-wide body to coordinate efforts. The management approach also differs in England, Scotland, Wales and Ireland. Generally speaking, most deer are culled by independent stalkers and provided the stalker has the appropriate fire arms certification and is carrying out the cull within the legal timeframe (see below) and with the permission of the land owner, anyone can shoot deer in England. There are courses run by deer management organisations to help improve the calibre of stalkers, but it is not mandatory to hold one of these Deer Stalking Certificates (DSC). Being wild animals, deer are considered property of the owner of the land on which they are killed, so shooting deer without the land owner’s permission is poaching. The Deer Commission Scotland is the lead agency in Scotland as set out under the Deer (Scotland) Act of 1997; the DCS is funded by the Scottish government and advises on the protection of agriculture, forestry and other natural heritage and welfare management issues. The closest comparable body in England and Wales is probably the Deer Initiative, which is a charitable partnership of 21 wildlife and farming groups that is responsible for some deer policy decisions. Unlike the Deer Commission in Scotland, the Deer Initiative cannot force landowners to control deer numbers on their land, although they do interface with Natural England (a non-departmental public body of the UK government), who can intervene if necessary. In Northern Ireland, deer control falls under the jurisdiction of the National Parks and Wildlife Service. In the Republic of Ireland the Irish Deer Management Forum and Deer Alliance Ireland are involved in deer management policies. More widely, in 1963 a growing need to control deer in Britain following the Second World War saw a contingent of the Mammal Society break away and form the British Deer Society. The BDS is a charity that advises regulatory and private bodies on subjects relating to deer management and welfare but, like the Deer Initiative, has no legal jurisdiction. The Deer Initiative has estimated that we should be culling around half a million deer, about a quarter of the estimated population, each year if we are to maintain numbers at manageable levels. It is unclear precisely how many Red deer should be culled, but in an interview with the BBC in 2005, BDS technical officer Hugh Rose, suggested that 30% of the population (about 120,000 animals) should be culled annually. Without a country-wide body to monitor deer stalking activity it is unknown how many Reds are culled each year, but it is thought to be fewer than the target. Stalkers can be broadly split into two groups: those with an interest in deer management who cull animals of all ages and both sexes, typically taking the carcass for venison or selling it to a game dealer; and “trophy hunters” whose primary interest is large males with impressive antlers. Part of the issue is a lack of full-time people falling into this first category or “deer managers” in the UK. In a recent investigation for the BBC current affairs series Countryfile, it was estimated that some 90% of stalkers shoot as a hobby. When trophy drives stalking it can lead to a shifting of selective pressures in the Red deer population. Taking the Highlands of Scotland as an example, it costs around £350 (about US$ 550 or €400) to shoot a stag on an organised stalk and, in a 1992 paper to the journal Nature, Tim Clutton-Brock and Steve Albon estimated that most of the 16,000 stags killed each year in the Highlands were shot by tenants and clients of stalking estates. The problem is two-fold. First there is a distinct preference among clients for shooting stags rather than hinds, because they make better trophies. The result is that hinds aren’t as popular and are either left to breed or killed, often at a financial loss, by estate employees. Secondly, big stags with impressive antlers are often more appealing to a stalker looking for a trophy than smaller stags. Where large males are preferentially culled there is a selective pressure towards smaller males with smaller antlers, because they’re the ones that survive to breed. This can reduce the quality of the population. So, to maintain a healthy Red deer population there must be a properly targeted cull of stags, hinds and calves to ensure a healthy procession of breeding stags each year. Some estates do this well, others less so. That deer don’t recognise boundaries further complicates the issue of effective management. The Forestry Commission try and maintain a population of about 100 to 150 Red deer in the New Forest, for example, but the Red stags often move onto private estates where the grazing is better and where they may be targeted by the landowners for their antlers. This makes it very difficult for the beat keepers to effectively manage the New Forests’ Red deer as they have no jurisdiction off the Crown Lands. In the long term this may result in a reduction in the quality of the Forest’s Red population and fewer high quality Red stags around might increase the likelihood of hinds mating with non-native Sika deer. With different organisations having different agendas when it comes to culling deer, the activity is not without conflict. This is particularly true where Red deer stalking is relied upon as a source of tourism. A good example of this conflict was seen in 2004, when more than 100 gamekeepers from 60 estates converged on the Glenfeshie Estate in Strathspey (Scotland) to protest about Scottish Natural Heritage’s plans to carry out a cull of the Red deer. SNH wanted to reduce the number of deer on their land because the browsing pressure is hampering forest regeneration. The gamekeepers point out, though, that Red stag stalking is their livelihood. In England and Wales, the open season (i.e. period when deer can be shot) for Red deer runs from 1st August until 30th April and 1st November until 28th February for stags and hinds, respectively. In Scotland stags can be shot between 1st July and 20th October, while the hind open season runs from 21st October to 15th February. In Ireland, Red deer are protected in County Kerry and cannot be shot, while for all other counties the stag season runs from 1st September to 31st December and the hind season 1st November until 28th February. In the Republic of Ireland, stalkers must apply to the National Parks & Wildlife Service for a deer hunting licence under under Section 29(1) of the Wildlife Act 1976-2012. Indeed, Red deer can pose a considerable problem for forestry, especially commercial conifer plantations and damage can be split roughly into that resulting from direct consumption (feeding damage) and that arising through more indirect actions (non-feeding damage). Deer will nibble on new growth, especially leading shoots and runners of saplings. Low and moderate level browsing of this nature can promote growth, but overgrazing can retard plant development. Deer will strip bark, which may or may not be eaten (bark may account for some 10% of the diet during harsh weather) and their feeding activity can result in a “browse line”, where the lower branches of trees are stripped clean of leaves and buds to a consistent height about two metres (6ft) above the ground. Indirect, or non-feeding, damage comes from trampling and fraying – during the rutting season, Red stags will fray vegetation as a means to remove velvet from their antlers and may rub against trees to remove loose hair during the moult. The stags generally fray tree saplings that are 10 cm (4 in. ), or less, in diameter, although they will damage larger trees if smaller ones are unavailable. Fraying damage is generally confined to a height of less than 1.5 m (5 ft.) from the ground. Deer grazing can prevent tree seedlings from growing, which is beneficial if the management aim is to maintain open grassland, but not if the desire is for woodland regeneration. Additionally, a penchant for browsing back undergrowth has also resulted in deer being implicated in the decline of ground-nesting bird species. There isn’t much evidence implicating Red deer specifically, but it seems that an overabundance of deer in general can lead to a decrease in songbird habitat quality through both decreased food resources and a decline in nest site quality and shelter. In terms of agriculture, deer can also make a nuisance of themselves, although the significance of the damage varies locally. Red deer are generally associated with damage to cereal and root crops, which they either eat or trample; they rarely occur in gardens and thus aren’t a significant problem to horticulture (compared with Roe deer), although Red deer are increasingly being seen in gardens in Exmoor National Park. Radio-tracking studies of the Red deer on Exmoor have shown that they can make extensive use of ‘improved pastures’ (those fertilized for use by livestock), especially during the night when some 25% and 35% of radio-fixes found hinds and stags, respectively, on these pastures. A similar tracking study on a Red deer hind from Ashtead Common in London revealed that, depending on the season, between 45% and 60% of GPS fixes found her on agricultural land. (Bear in mind this may not be representative, given that only a single hind was collared.) The authors of the study, conducted with funding from DEFRA, suggest that the hind may have been targeting what farmers refer to as the ‘early bite’; the start of the growing season when grass is at its most nutritious. The most striking finding of these studies is that there is considerable variation both with season and locality of damage making it difficult not only to measure but also predict. Moreover, many of these studies were conducted a decade or more ago and may no longer be representative. Certainly, the oft-cited financial estimate of deer wheat crop damage of £60 per hectare per year in eastern England is likely to be out of date, the study having been published in 2003. Nonetheless, it does appear that Red deer damage to crops is more likely where densities are greater than about one animal per four square kilometres (1.5 miles). Deer may also compete with livestock for pasture. In general, Red deer do not appear to actively intermingle with most livestock and many seem to actively avoid using the same areas at the same time, although every mouthful of grass eaten by a deer is no longer available for a cow, horse or sheep. A study in Denmark’s Veluwezoom National Park by Loek Kuiters and colleagues found that Red deer were attracted to pastures previously grazed by cattle and they avoided pastures early in the growing season when the grass was longer. During the winter the cattle left the pastures once the sward (grass height) dropped to about 6.5cm (2.6 in. ), because their feeding style cannot utilise such short grass. The more delicate mechanism of the Red deer, by contrast, can utilise sward heights down to about 2cm (0.8 in.). In the New Forest, I have never noted Red deer using cattle fields, nor grazing with cattle on the open Forest. By contrast, I frequently observe Red deer and horses in farm fields together and, although each normally keeps to its own herd, I have seen them grazing together. There was also an interesting video of a young Red deer moving together with a flock of sheep, filmed by Andrew Capell on his farm at Dunwich Heath in Suffolk during the winter of 2012/2013. Overall, it has been well established that Red deer can have a major impact on forestry and some native woodland plants and cereal crops if numbers exceed a critical threshold. There is also the potential for their grazing activity to affect some woodland bird species. Some, admittedly rather circumstantial, evidence exists to suggest there may be competition with other deer species that affect deer impact at a larger scale. It seems, for example, that Fallow deer in parks often do worse when a large population of Red deer is present. Large populations may also affect the health of the deer, making them more susceptible to disease including some that could potentially be transmitted to livestock, and increase the potential for them to venture onto roads. When considering deer in general, it seems that road traffic accidents where motorists hit deer (also referred to as Deer-Vehicle Collisions, or abbreviated to DVCs) are a growing problem in Britain, although there is a paucity of recent data. In 2007, the Deer Initiative published some preliminary results from their Deer On Our Roads survey, conducted in conjunction with the Highways Agency. The results make rather depressing reading, showing that between January and December 2005, there were more than 30,500 reports of DVCs in Britain, of which nearly 25,000 (82%) occurred in England. Worse still was that many—perhaps, according to the Deer Initiative, as many as 80%—DVCs go unreported such that the total number per year could be 74,000 or higher. The majority of DVCs involve Fallow, with Roe being the second most commonly struck – Red deer are rarely hit by vehicles and they, combined with Sika and Chinese water deer make up only 3% of reported cases. In Scotland, where Red deer numbers are higher, they accounted for 25% of DVCs. According to the survey, DVCs involving Red deer were most likely to occur between October and January; the reasons are probably two-fold, with the nights drawing in (making driving conditions more dangerous) and the deer being more active (rutting) at this time of year. It should be noted that national statistics may hide local variations or so-called “DVC hotspots”, such as the New Forest. Indeed, even within the Forest, the number of deer collisions and species involved varies considerably year on year as the graph illustrates. Looking at Red deer involved in DVCs between 2005 and 2016, on average three are killed each year (6% of the deer casualties); but the standard deviation for this mean is also three, giving a CoV of 100%. In other words, the number or Red deer killed on Forest roads is highly variable between years. We know that the Normans transported deer, particularly Fallow (Dama dama), around the Mediterranean and established some deer parks in Britain during their occupation. The parks proliferated significantly during the medieval period, providing a source of fresh and salted meat that was particularly important during the winter months. O'Reilly and Lawrence describe how by 1086, William the Conqueror had established 25 forests and 35 parks, all stocked with native deer - i.e. Red and Roe (Capreolus capreolus). Fallow were a later addition. By 1300 the number of parks stood at about 2,000. The number of parks waxed and waned in response to population growth and the aristocracy's interest in deer, but the rapidly growing population saw parkland increasingly turned over to agriculture and forestry; parks became smaller and deer took on a more ornamental role. In some cases, parks served as a reservior for the introduction of deer into the wild. In the 2009 Countryfile investigation on the subject of deer numbers in Britain it was estimated that there may be as many as 200 DVCs per day, with 20 people killed per year in such accidents – this leads to some £20 million (US$ 31m or €23m) worth of insurance claims per year. The subject of DVCs, including methods being trialled to reduce their frequency, is covered in greater detail in the main deer article. It was actually during the Victorian period that the foundations were laid for one of the longest studies on a wild mammal population conducted anywhere in the world. According to Fletcher, the (second) Marquis of Salisbury bought the island of Rum in 1845 (for £26,455), with the apparent goal of making it a hunting estate – he reintroduced Red deer to the island and tried, in vain, to establish a population of Fallow. The island was sold again, this time to Farquhar Campbell, in 1870, and at this point there were an estimated 600 Red deer on it. The island was sold a third time, to John Bullough, in 1888 and remained in the Bullough family until it was bought by the Nature Conservancy Council in 1958, with the aim of using it as an outdoor laboratory. In 1958 the first studies on the Red deer of Rum began, looking at grazing patterns, and since then the group (whom I have referred to as the ‘Red Deer Research Group’ throughout this article) has involved more than 30 scientists based at various institutions (Cambridge and Edinburgh Universities being the main two) and has done more to untangle the mysteries of Red deer ecology, behaviour and biology than any other group. The RDRG’s work continues today, meaning that the Red deer on Rum have been under constant study for 52 years. Anyone interested in reading more on the history and findings of the RDRG is directed to their website. Deer parks provide an opportunity for many people to get a good view of animals that are otherwise generally fairly elusive and timid. Every autumn photographers and naturalists flock to Britain’s deer parks and forests to try and catch a glimpse of the rut and this can lead to problems. In parks, where deer are acclimated to human activity, they generally seem relatively at ease. In a study published in the journal Animal Welfare during 1992, Jochen Langbein and Rory Putman report that although both Red and Fallow deer in Richmond and Bushy Parks (both in London) were disturbed by people nearby (i.e. they were more vigilant), this was transitory and there was no overall observable impact on the health of the deer. This has not always been the case in deer parks, however, and, as Norma Chapman points out in her book Deer, London’s Hyde Park used to have deer until they were moved to other parks in 1883 because there was a high incidence of dogs chasing deer into the path of oncoming vehicles; Richmond Park is experiences similar problems today. In addition, human disturbance was tentatively implicated in the large die-off of Red and Fallow deer in Richmond Park during the mid-1980s. How significant human disturbance is on deer populations seems largely dependent upon how accustomed the deer are to humans. Thus, although Richmond and Bushy Park deer (which are exposed to humans on a daily basis, often for long periods) may not be unduly affected, the situation can be very different in areas where the deer remain more secluded. According to keepers in one area of the New Forest, for example, the Red deer rut is becoming an increasingly dangerous time as photographers place themselves too close to the action – in some cases, between two challenging stags. 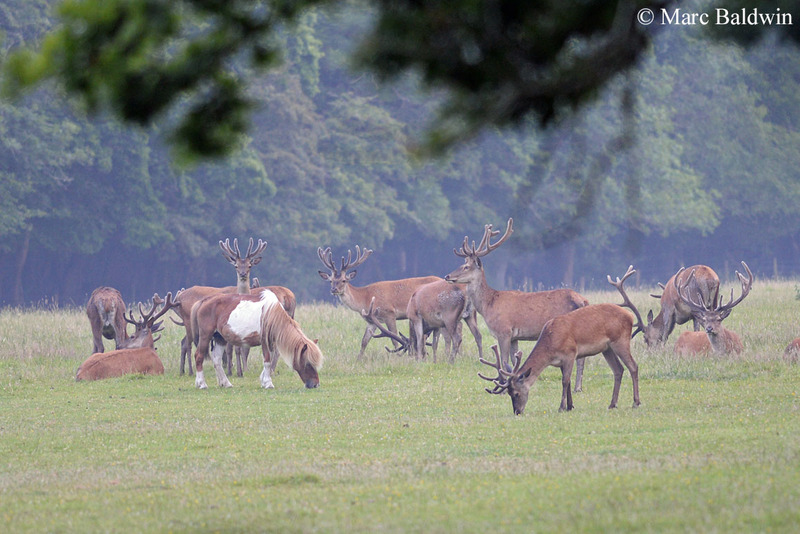 In the case of the New Forest Red deer rut, the keepers have noticed a change in the deer’s behaviour and distribution patterns. It seems that the increased disturbance is causing deer to move out of the region, increasing their susceptibility to traffic collisions and causing them to move into Sika (Cervus nippon) 'territory', where they are currently shot on site in a bid to prevent hybridization. Parks where deer are raised primarily for the provision of meat or stud, rather than to help maintain a landscape or for tourism purposes, can be considered true deer farms. John and Nickie Fletcher set-up the first commercial deer farm in Britain at Reediehill Farm, near Auchtermuchty in Scotland in 1974 and now, according to the British Deer Farmers Association, there are about 28,000 Red deer farmed commercially in the UK across some 300 farms – this represents almost 80% of the total number of deer farmed in the country. Generally, stags are culled at between 15 and 17 months, whilst hinds are dispatched slightly later, at about 27 months old and the carcass is hung for at least a week before being processed by a butcher. Venison prices in the UK are still fairly high and in early 2009 it was fetching about £1.50 (roughly US$ 2.35 or €1.73) per pound, which is about £3.30 per kilo – a topside or silverside steak of Scottish Red deer venison (from Fletcher’s farm) will set you back about £27 per kilo (£12 per lb.). In his book A Life for Deer Fletcher unsurprisingly extols the virtues of venison as a healthier alternative to traditional livestock meat, pointing out that livestock are “rich in injurious saturates”, while most game species are rich in the fatty acids (e.g. omega-3 and -6 fatty acids) that are essential for body function and neural tissue (most notably brain) development. If one considers that the deer may have lived all its life in an open park or forest before being dispatched by a competent stalker, it certainly seems to me to offer a potential source of meat to vegetarians who chose the diet solely on animal welfare (based around intensive farming and slaughterhouse conditions) grounds.